Timaya has an eye for exotic cars and he never fails to acquire them when he feels there is a need to. Last year, he bought four rare cars within a period of 2 months. 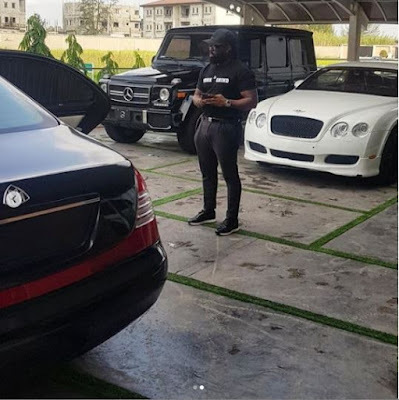 The former plantain seller just showed off the lovely rides in his garage. The 38-year old father of three has two babymamas and he is living the life of his dreams. Enitimi Alfred Odom, better known by his stage name Timaya, is a Nigerian singer and songwriter. He is the founder of South South hip hop group Dem Mama Soldiers. His solo career began in 2005 with the release of "Dem Mama", which also appeared on his debut album, True Story released the following year.